The ICT4Life project has come to a very important stage since one candidate for the European Commission‘s Innovation Award 2018 is the ICT4Life project and thus NETIS. We are featured in the Best Early Stage Innovation Project category with nine competitors. A jury will choose the winner, but only the best four will have the chance, so we have to support NETIS and ICT4Life with votes. You can vote here or with a click to the picture below, with the “Vote” button, no registration or email address is required. 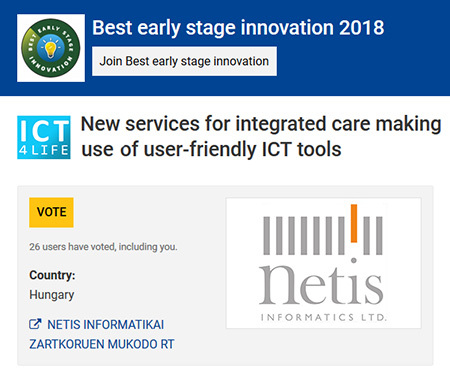 Thank you for supporting NETIS and the ICT4Life project with your vote!